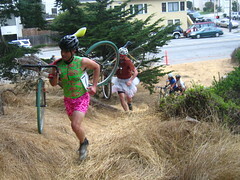 Who could resist San Francisco’s dfL Urban Outlaw Cyclo-cross- dress series? It’s a great way to get ready for cyclocross season, and a chance to show off your best tights under a fabulous little miniskirt. If you show up in a dress, you save the $5 race fee, and there’s a Hunter frame going to the overall best dressed in the whole series. You’ve already missed the first date: it was last night, but there’s still a 6 p.m. race September 20th at Crocker Amazon Park, another September 27th – same place and time, and the final race September 30th at 10 a.m. at Golden Gate Park, with a potluck to follow. Also, the Specialized Angel has really let herself go.